Every year, governments are diverting $1 trillion dollars away from people and public services into the hands of big companies, whilst across the world, hundreds of millions of people are denied their basic rights. 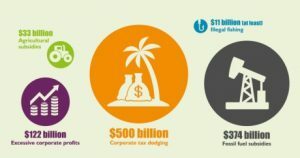 HPA’s new briefing – endorsed by PHM and others – “Changing track: putting people before corporations”calculates that over $1 trillion (or a million million) is being diverted by governments each year. That’s enough to triple the money spent on healthcare for half the world’s population or cancel all government debt of impoverished countries!